Oh Snap! The Friggin Amazing J.Ho Sketchblog...: This Is Not A Good Title. This Is Not A Good Title. One of the websites that I would have normally used (to link useful reference pictures of action figures and so forth) was unavailable at the time of this post. I will update later when the site has returned. UPDATE: links to Battle Armor Skeletor and Accessory Pack added. The first thing that strikes me is the alarming similarity between the pose on this one and last Tuesday's post. O_O This was totally unintentional and all I can say in my defense is that the two pieces were not drawn consecutively, and both were inked and scanned months and months ago. The posting of the two pieces in such close proximity is an oversight on my part--I have to admit, over the past several months I've been drawing dozens and dozens of gestures for He-Man characters (many of which have not been completed/posted yet) and it's getting hard to come up with original poses. I can at least promise you that the next few He-Man illustrations will have varying poses. Back to Armorax--the weapon he's holding is somewhat based on an axe that Skeletor used in the pilot episode of the series, "The Diamond Ray of Disappearace." I also had in mind the blue axe from the Accessory Pack. He has a bonus bat-cape to match my illustration of Skeletor, though Armorax's cape is shorter because Skeletor outranks him (more on that in the bio below). Armorax has a "normal face" but wears a skull mask to show his allegiance to Skeletor (more on that in the bio as well). The idea is that he is from the same race as Skeletor, but lacks the mutation/deformity that Skeletor is cursed with. I also wanted to show some battle damage as a nod to the original action figure (whose chest armor would show gashes upon impact) but at the same time, I didn't want to obscure the cool bat symbol too much. As a compromise, I gave him a nasty gash in his skull mask. As for colors, the only noteworthy deviation from the original is the mask itself. I gave Armorax a mask of bleached bone to distinguish him from Skeletor's yellowed skull. 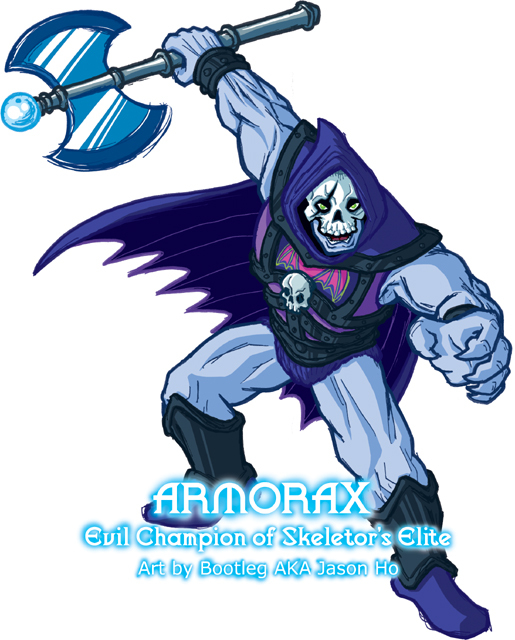 PROFILE: Brash, cruel, and arrogant, ARMORAX is the perfect champion for Skeletor's Elite. He is a virtually unparalleled melee fighter and combat spellcaster, and an excellent field tactician, though slightly lacking in experience. His chestplate, enchanted with his own dark magicks, provides him almost unlimited protection from physical attacks. His axe, imbued with sorcerous power by the evil powers of Infinita itself, is an artifact that was awarded to him by Skeletor himself. According to various rumors, his skull mask hides a horribly scarred face, or grants him the fighting spirit of a demon, or both. Neither of these rumors are true--in fact, he wears the mask as a sincere tribute to his master and mentor Skeletor, and his combat abilities are born of training and intuition. The scar on the mask comes from a particularly intense sparring session with Skeletor himself, and Armorax brandishes it proudly. HISTORY: Skeletor's Elite are a group of cabalistic disciples, trained by Skeletor himself. Perpetually distrustful of his lieutenants (and with good cause), Skeletor formed this loyal, tight-knit inner circle to seize the reins of power in the event of his extended absense. With the disappearance of He-Man and Skeletor, the Elite have revealed themselves, much to the dismay of Skeletor's highest ranking evil warriors, Evil-Lyn in particular. Armorax was one of the first recruits, and of the first wave, the only to survive the fatal rigours of Skeletor's training regimen. His loyalty to Skeletor is absolute, however he was dismayed to learn that being Skeletor's named champion did not also grant him a position as leader of the Elite. TERROR CLAW received that honor, and Armorax is constantly smouldering with fury over this appointment. Armorax's resentment of Terror Claw is a fracture in the Elite that Evil-Lyn has picked up on, and intends to exploit. Very nice my fren. I like the slash on his mask. This one took me back, when I was a wee lad i use to have the battle damage He-Man. Awww..memories...sniff..sniff....hold me! See! Just some minor adjustments in pose can bring in some very dynamic characterization and drama. I remember I was home sick after having my second operation and the teacher that was supposed to be my 2nd grade teacher would call after school and see if he could come over to tutor me so I wouldnt be left behind the following year (I missed half the 2nd grade). I faked being sick one day and went tot eh store with my mom and bought the Battle Damage Skeletor instead! lord shen: that's awesome! i'm stirring up a lot of childhood memories with this one, i see!